What is described to some as crude humor to others is the best kind of humor. 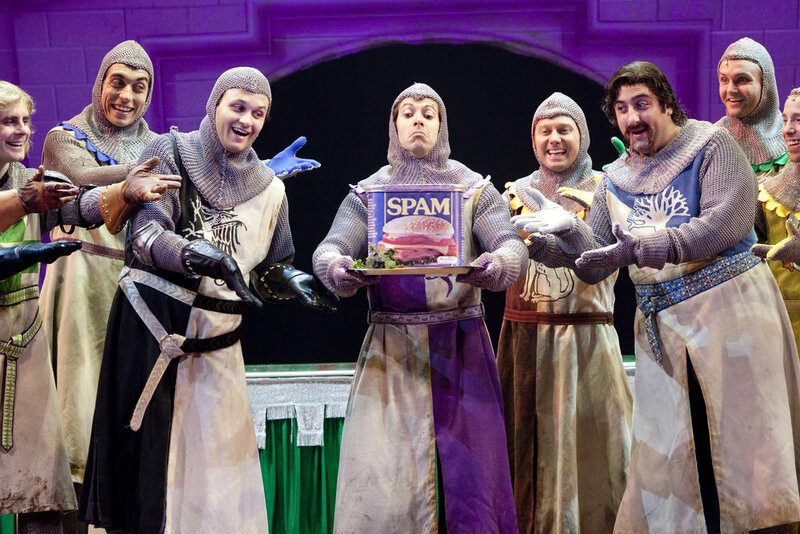 I was delighted to see that the touring production of Monty Python’s Spamalot was touring and would be making a stop in St. Paul at the Ordway. Adapted from the 1975 film, Monty Python and the Holy Grail, this production moved to Broadway in 2005 and stars a lot of well-known names. The Broadway production was even nominated for 14 Tony awards and won three including Best Musical. The Broadway run even starred some now very big names including Tim Curry, David Hyde Pierce, Christian Borle and Sara Ramirez (Greys Anatomy). Spamalot tells the story of King Arthur and the knights of the round table on their quest to find the Holy Grail but in true Monty Python fashion. The parody loosely tells the tale but often diverts from the traditional story with hilarious shenanigans. As Arthur begins the show by finding knights to join him, he encounters the Lady of the Lake, Prince Herbert, Tim the Enchanter, the Knights who say Ni and of course…the Black Knight. The show is not only comical but visually fun due to its capacity of creating a set, designed by Tim Hatley and modifications by James Kronzer, that truly feels like it belongs in the world of the play. Actors are able to quickly pop in and out on stage through windows of castles, top ledges of walls and by spinning set pieces around to create new scenes. It serves the purpose of being a set but also adds a fun level of campiness to it. 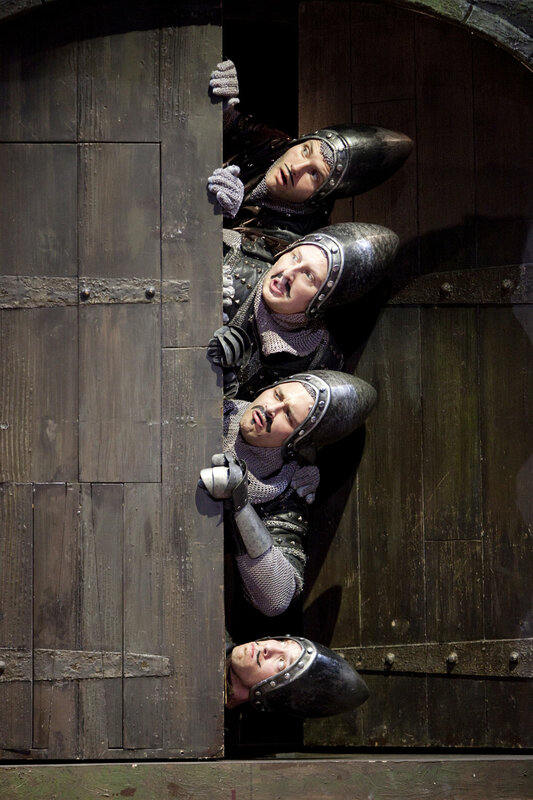 Spamalot is such a smart musical as well due to its consistent use of breaking the fourth wall. There is something that is slightly amusing about a break here and there however when it’s done throughout the entire show – and done right- it truly creates something entertaining. Eric Idle and John Du Prez also create an equally hysterical score and lyrics that keeps this theme going especially with songs like “The Diva’s Lament.” The song features the Lady of the Lake singing how she hasn’t been on stage for some time and hopes that the audience doesn’t forget her. The lyrics also taunts and satirizes the structure of musicals with the reoccurring song and reprise titled “The Song That Goes Like This.” This song truly had seasoned theatre goers nodding along in agreement. Let’s just start by saying that hilarity ensues from the moment the first actor steps on stage till the last bow. Except for two, each performer plays a multitude of roles and does them all brilliantly. It was written that way to honor the original movie as well. Due to this model of casting, it truly allows everyone to have a spotlight moment on stage. Whether they are given a solo song or an epic dance number, each individual performer shines like the Holy Grail they sought after. Steve McCoy plays King Arthur and does so majestically with a stunning and rich voice. 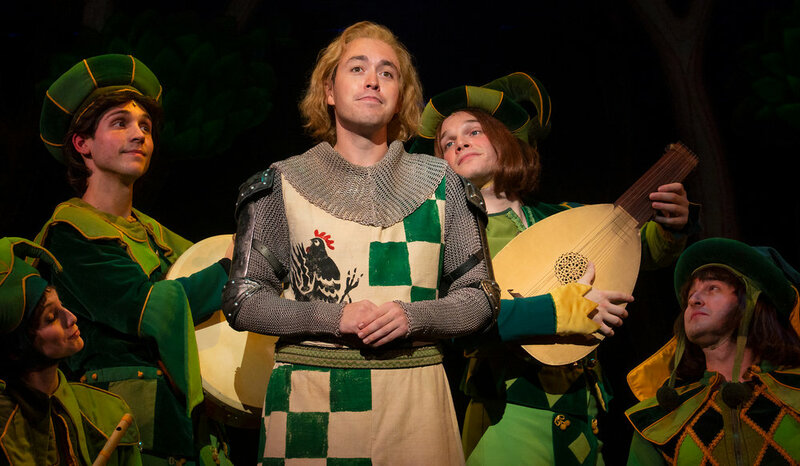 Adam Grabau was fantastic as Sir Lancelot and earned many laughs with his coming out style song titled “His Name is Lancelot.” Everyone’s favorite bit of the coconuts imitating horse riding is back with Jason Elliott Brown’s portrayal as Patsy, the Kings servant, was fantastic. 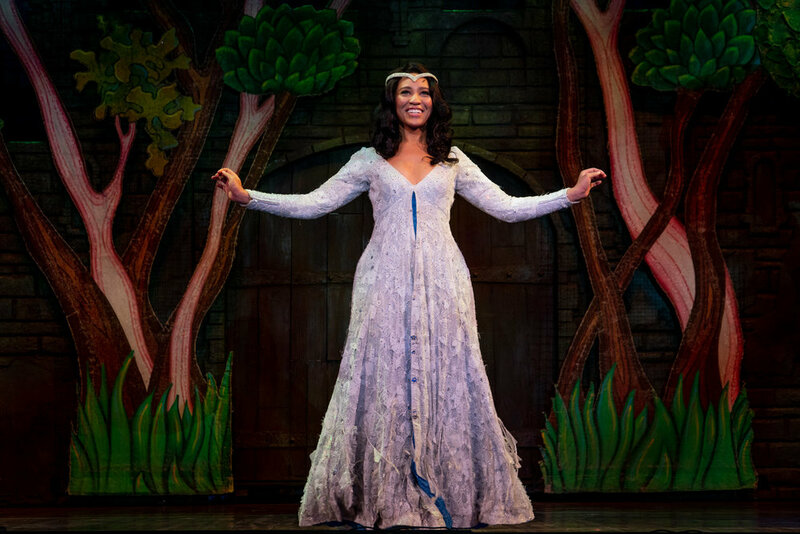 The shining star of this show however is Leslie Jackson as The Lady of the Lake. Jackson has the whole package with a stunning voice and impeccable comedic timing. Her Mariah Carey-esque runs in songs like “Find Your Grail” was answered with loud applause and the urge for many to give a standing ovation mid-show. Her range is undeniably one of the best I’ve heard upon hitting the lowest of notes while also effortlessly belting the highest and maintaining to stay in her chest voice. Monty Python’s Spamalot is a side-splitting outrageous comedy that is perfect for families and groups of friends who are looking for a night out full of laughs. 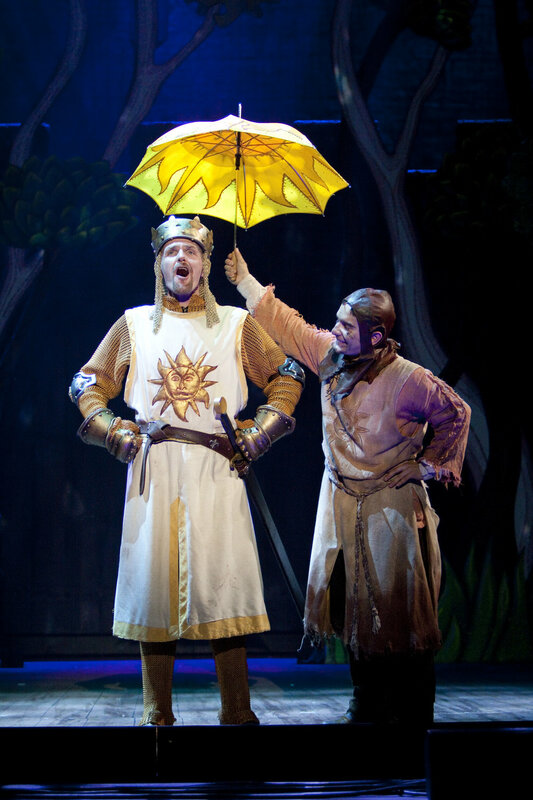 Monty Python’s Spamalot runs at the Ordway Center for Performing Arts now through April 7.